Online casino gambling is a pastime many people view as a money making opportunity. Others simply see it as fun, for which they’re willing to pay money – in the shape of the house edge and house drop. None of these two categories are immune to gambler’s fallacy though. The best way to explain how the gambler’s fallacy works is through an example: suppose a friend of yours made a bet with you to flip a coin and to get heads10 consecutive times. What odds would you offer on such a bet? If you were to give 1,000-1, you’d be ok: you’d still come out on top. If he made his heads 9 times in a row though, would you offer him the same 1000-1 odds? If you were to do so, you’d be grievously wrong, because regardless of the fact that the previous 9 coin-tosses resulted in heads, a head is no more likely to pop up on the last one than it was on the very first flip. In a word: the outcome of each and every coin-toss is on the very first flip. In a word: the outcome of each and every coin-toss is 100% independent of the previous flip’s outcome, and your odds for hitting tails are exactly 50-50 every time. How exactly does gambler’s fallacy influence gambling? People are naturally inclined to look for patterns in chaos. We’re all programmed to try to make sense of things, sometimes even of occurrences that are completely random and chaotic and which carry no sense whatsoever. This is the very reason why people go about looking for patterns in the numbers the roulette wheel spits out. The same goes for every game which is based on randomly generated numbers. People play the roulette and think: the last 5 spins all resulted in black, a red is bound to land soon. This way of thinking is apparently encoded into our brains on such a basic level, that we can’t do anything to shake free from it. Even when I watch a wheel I don’t play at and see several black results turning up in a row, and I focus on the fact that none of the spins is dependant on the last one, deep down inside I still kind of wait for that red one to pop up. The Gambler’s fallacy is at the base of the Martingale system, of which I suppose every gambler has heard. The Martingale system consists in doubling one’s bet every time he/she loses, in order to recover the losses. With an infinitely large bankroll, the Martingale system would probably work too, but because of the fact that all roulette spins are completely independent, extremely long losing streaks may occur without a problem, which may easily be long enough to kill the bankroll of the player who has the blissful temerity of actually staking money on the fallacious Martingale System. One thing has to be noted about gambler’s fallacy though. It’s only a fallacy when it occurs at tables where the object of the event players bet on is reset for every bet. In blackjack for instance, as cards get removed from the deck, events directly impact subsequent ones. There, the “gambler’s fallacy” is at the very base of various card counting techniques. If the blackjack deck were substituted with a completely new one after every round, card counting would be impossible. Whenever you decide to play in an online casino, make sure you pick one that gives you a loyalty deal like rakeback in poker. Gambling – This site disclaimer is for online casino and general gambling information purposes only and is intended to assist you in choosing an online casino. You can not gamble on this site. Information – We will attempt to keep all our information up to date. 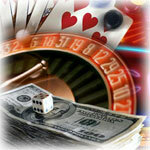 The online casinos do, however make changes to their bonus offers and terms and conditions. No online casino will be bound by the terms of an outdated advertisement or promotion, we cannot be held liable for having any outdated information on this site. We strongly advise that you check through the casino site before playing to ascertain the casinos current terms and conditions. Legality – Gambling may be illegal in certain jurisdictions or countries. We cannot determine the legal status of online gambling for each site visitor. We would suggest that you check with your local authorities before gambling online. South African Online Gambling ( Interactive Gambling ) – Please take note that although interactive gambling in South Africa is currently in the process of being legalized – the current status is that interactive gambling from within the Republic of South Africa is illegal. Whilst we promote the Rand currency – this is for players outside of South African borders wishing to gamble in Rands – It is not for South African Residents. Furthermore – In terms of the Exchange Control Rules, it is illegal for South African residents to participate in foreign lotteries, sweepstakes and betting organizations. Age – It is illegal for persons under 18 years of age to gamble. Player Identification – This site www.topbossblog.com,( Topboss Blog ), does not obtain or have any access to any player/s identification or casino account details. This is private information kept by the casino only. Liability – We have used whatever means we have at our disposal to try and list only those casinos who have the ability to honor their commitments. We don’t have insight into their financial status and thus will not be held liable for their actions. Arbitration – We are totally independent to any of the online casino/s, nor do we have any ownership or share holding/s with any online casino/s. Should you experience difficulty in your dealings with any of the casinos listed, we will happily provide whatever support at our disposal in an effort to resolve your dispute. Casino Rules – We remind you that online casinos have terms and conditions/rules and that it is your responsibility to familiarize yourself with the casinos rules before playing there. Welcome Bonus – Most online Casinos offer new players a welcome bonus. There is a play through requirement that the player must play before the player may cash in. The play through requirement will vary from casino to casino, we therefore advise you to read all terms and conditions including any terms and conditions relating to play through requirements.